Single Stage homogenizers provide high throughput capabilities and superior mixing results. The IKA HED 2000 is excellent for de-agglomerating, dispersing, emulsifying, blending, disintegrating and homogenizing. A low-shear-machine for quantities from approx. 2.500 to 60.000 l/h, suitable for smoothing, after-homogenizing and conveying of shear-sensitive products. For continuous processing or batch re-circulation of products. Disperses solids into liquids and emulsifies in a fraction of the time. 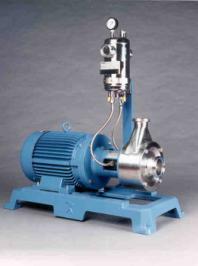 Excellent pumping action can eliminate existing pumps and overhead mixers.